The 6th Annual Clifton Beer Fest takes place tonight from 4pm to 9pm at Fries Cafe on Jefferson Avenue (map). The beer tasting event will feature 70 American craft beers available in 4oz tastings for $1 to $2 each. In addition to the great beers to sample, the Rumpke Mountain Boys will providing live music on Fries' outdoor patio. 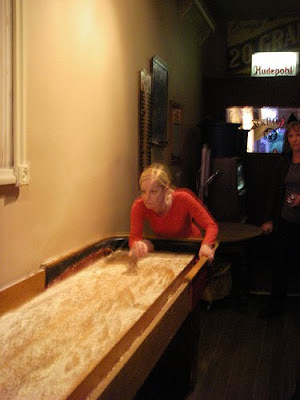 There will also be burgers, bratts and metts available in addition to the best shuffle board in Cincinnati downstairs in the comfortable main bar area. Last year's Clifton Beer Fest was great fun with an absolutely fantastic beer selection. The upstairs outdoor patio was a terrific spot to mill about enjoying a variety of beers and fraternizing with all the other beer-lovers and Cliftonites. If you haven't been to Fries Cafe (not pronounced like the things you get from McDonalds - tip: pronounce the second vowel in German words), then you must go to check out the great neighborhood bar that is extremely comfortable and a great place to have a few drinks served up over good conversation. UrbanCincy's recommendation: Get to Fries Cafe early (around 4pm) for some great beer, food and music then make your way to Fountain Square to catch the amazing concert lineup for Popopolis which starts at 7pm. Since you've more than likely had too much to drink to drive down to Fountain Square just hop on the Cincinnati Streetcar and head south until it drops you right off at the Square #17, 18, or 19 Metro bus route that picks up at Clifton and Ludlow avenues. Take the bus all the way down to Government Square and simply walk a block west to Fountain Square. Special thanks to Hoperatives for reminding us here at UrbanCincy about this great annual event in Clifton. Photo courtesy of Flickr user bonegirl. When I suggested on your 10/1 post that Metro do some later & more frequent weekend runs, the routes you mentioned in this post are the routes I was thinking of, specifically the 17 that runs from downtown, up Main through Clifton, Northside & College Hill. The whole route is full of food, drink, music and PEOPLE. Yeah, I don't understand the lack of quality late night routes through this part of the city. Just recently I took Metro from Clifton to Northside, and when our group finally left Northside are options for a bus back were exhausted. We started the long trek up the hill until a friend finally picked us up.